HUNA training is for anyone interested in spiritual growth, personal development, healing, expansion of awareness and connection to universal spirit. This basic course is not only transformational, it provides a foundation that can lead to more advanced HUNA learning and opportunity to become a certified Kumu (teacher). The approved curriculum is based on the Twelve-Lesson HUNA Correspondence Course (1992). Students receive handouts after every lesson. Graduates receive certifications from HUNA Life International, and from Bridges.Academy. Optional: 14 hours of approved Continuing Education Units from the Alchemy Institute of Hypnosis is available to hypnotherapists and psychotherapists at an additional cost of $40.00. HUNA is an ancient wisdom that reconnects us to the energy of life. A HUNA practice helps us to achieve peace, personal balance and optimum health. Through the practice of HUNA, we can manage and direct our energies effectively through a deep understanding of the real meaning of personal power, intention, and belief. HUNA empowers and informs other spiritual, shamanistic, and metaphysical practices. HUNA refers to the timeless mystical teaching and practices of the ancient wise men and women of Hawaii, the KaHUNA (or Shamans). HUNA is believed to be over 35,000 years old and consists of universal life principles encompassing elements of psychology, philosophy and spirituality. The teachings were re-discovered in the 20th century. 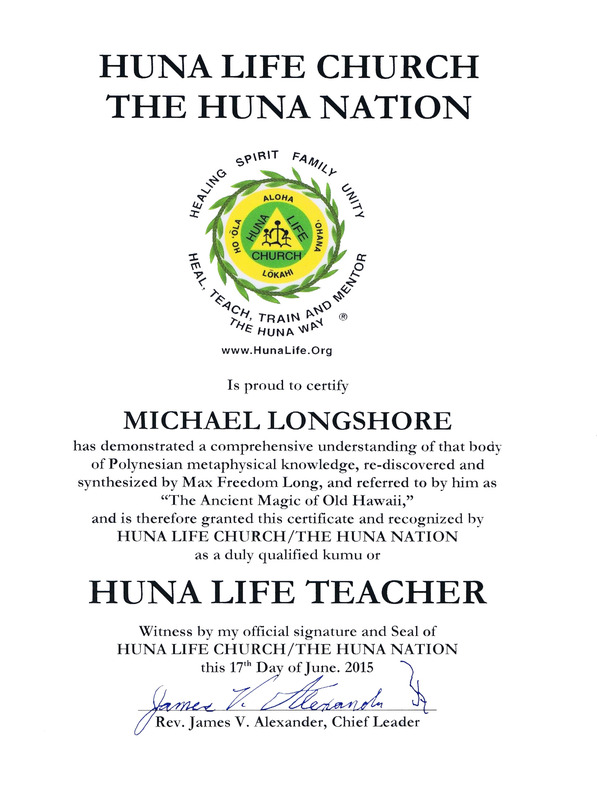 Your Kumu (teacher) Michael Longshore is one the few approved teachers in the world. The curriculum is based on the works of Dr. E. Otha Wingo, head of the HUNA Research Associates and the author of Twelve-Lesson HUNA Correspondence Course (1992). It teaches the practical application of the HUNA teachings including how to achieve success and healing in your life. HUNA teaches us of the three “Selves”. The Basic Self is your storehouse of memory and seat of emotion, the Middle Self is your ability to reason, and the High Self is the seat of your spiritual power and consciousness. Each self plays an essential role in our existence. By integrating them through the HUNA teachings we can live healthy, harmonious and vibrant lives. HUNA teaches us to work with the essential life force, and how to properly channel and direct life force energies to heal, eliminate blocks and bring about genuine transformation and peace within. In the 1960’s, Dr. Wingo discovered the work of Max Freedom Long (1890-1971). Long wrote many books about the Huna techniques that Hawaiian shamans used prior to the coming of the missionaries, and founded the Huna Research, Inc. in 1945. In accordance with Max Freedom Long's wishes, Dr Wingo assumed leadership of HRI after his death in 1971. Thereafter, Dr. Wingo was executive director of HRI for over 40 years. Dr. Wingo said this of HUNA: "There are no gurus and nothing you have to believe. Once you know and understand the principles of Huna, it's not something you stop and do. It's your whole way of thinking. This is the natural state of the human being." “Applying Huna principles has greatly facilitated the resolution of problems, especially those involving personal relationships….. I am able to step back and let ‘life happen’ for my children……. Huna has helped provide missing pieces of my self-understanding. E.G. Sign up now and receive the first lesson!